The No. 8 Texas soccer team overcame an own goal to leave Stillwater, Okla. with a 1-1 draw Friday night. The double overtime tie with No. 13 Oklahoma State keeps the Longhorns (9-0-2) unbeaten through 11 games. Cyera Hintzen made the game-tying goal, her ninth overall this season, in the 77th minute. Atu Mshana assisted on the play. “Really proud of the perseverance of our team, to come back after one goal down and to find the resiliency to put an absolutely world class goal away,” head coach Angela Kelly said on the team’s Twitter page. There were 26 combined fouls in the match and 32 shots. Texas held the advantage in shots, 18-14, while putting five on goal. Oklahoma State put three shots on goal. “To be perfectly honest that’s one of the most physical games I’ve ever been apart of, playing or coaching,” Kelly said. Texas fell behind on an own goal in the 23rd minute and trailed at halftime. Both teams had opportunities to score in the overtime periods. 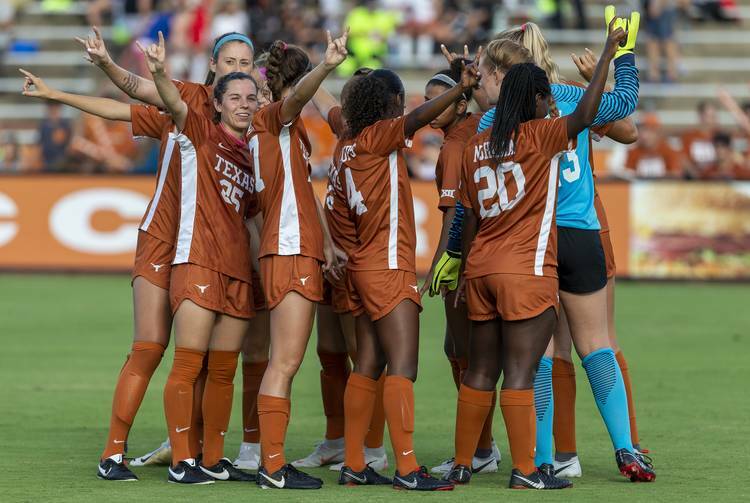 The Longhorns cleared away a corner kick in the 107th minute. Haley Berg had one final shot in the 109th minute, saved by Dani Greenlee. The Longhorns don’t have too much time to rest as they take on TCU Sunday at 1 p.m. in Fort Worth.